The “HEPTAPOLIS” will be a Global Standard Ecological-Geometric City. It will be built on horizontal planes, designated by three concentric, circles with radii of unequal length. Each circle will extend to a different height scale, and the maximum (outer) will be enrolled in regular, equilateral heptagon walls, known as OLYMPIAN WALLS. In the PROPYLAIA of the “HEPTAPOLIS” will be placed a magnificent marble statue of Alexander the Great on the throne, crowned by Hellas. On either side, seated at his feet, History and Glory lean on his legs. The OLYMPIAN WALLS will be built by hewn stones that are called PETRES (Latin script). PETRES will bear the names of donors who paid the cost of PETRES for the construction and installation on the walls. The OLYMPIAN WALLS will be 7 meters in height with exterior buttresses, similar to those of the Acropolis of Athens. In the middle of each side will be a gate, 27 meters wide and 9 meters high. The total length of each side of the walls will be 574 meters. The main gate of «HEPTAPOLIS», called the EPHESUS GATE will have a length of 55 meters and height of 9 meters and will be in three parallel rows, a total of 3 x 9 = 27 columns. The gate will be called GATE OF LIGHT, featuring on 2 giant bases, the statues of Apollo and Athena. The side walls of the GATE OF LIGHT will be parallel to the imaginary axis of the spring and winter solstices on the site in which the «HEPTAPOLIS» is built. 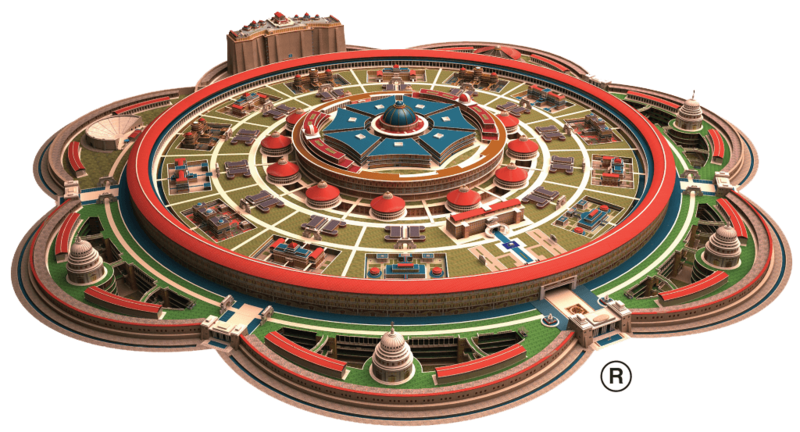 Inside the “HEPTAPOLIS” will be divided into peripheral zones which will tend to the center and will be called: ZOSTER, KYTTARON, PIREN and THOLOS (Dome). A key objective for the intellectual coherence that should govern the distinguished population “HEPTAPOLIS” will be the optimal selection of the excellent in the world in spirit, science and arts so as to adorn, whether as acting or as honorary members, the internal as well as the external society. The Society “HEPTAPOLIS”, i.e., builders and zealots of a better world through “HEPTAPOLIS”, which will include thousands of members of the Universal Intellectual Center “OLYMPOS”, will be consolidated through the website and with spiritual guide and intellectual axis the “HEPTAPOLIS”, will be constitute “an active, single entity” to help solve Cultural or Social problems, particularly issues related to protecting the ecosystem and health of our planet. EXTERNAL society is composed mainly of members who visit the ZOSTER, and will participate in the intellectual, scientific and artistic events of the “HEPTAPOLIS”, with priority over any other citizen. We have the right to introduce proposals and issues in the Senate “HEPTAPOLIS”, which, upon evaluation will be introduced to the ACADEMY OF NATIONS. The academicians of the ACADEMY OF NATIONS, strictly selected from each country on Earth, will be responsible for implementing the educational program in schools of the KYTTARON and the wider spiritual activities in the MELATHRON and the Centers of ZOSTER and the PIREN. Academicians will also be cultural ambassadors of their respective countries in the HEPTAPOLIS society. In every case, the supreme body for all decisions of all actors “HEPTAPOLIS” will be the Governing Council of the Society “OLYMPOS”. In the area of the ALEXANDRIAN LIBRARY, where academicians’ countries will display their cultural wealth, there will be special apartments, which can be used for academicians’ accommodation, according to their respective duties. Academicians-ambassadors will bring to “HEPTAPOLIS” their countries’ cultural, scientific and social achievements and activities, which could constitute “topics for promotion” in the Academy or the cultural centers in ZOSTER. Each country’s representative and connecting link with “HEPTAPOLIS” will be its academician. The library in each country, which is part of ALEXANDRIAN LIBRARY, supervised by the academic representatives. For acceptance into “HEPTAPOLIS”, the candidate students of each country will submit their applications to the relevant ministry of their country. Subsequently, the ministry will send the written applications of selected candidates to the office of the country’s academician, who will study and submit them to the PRYTANEIONfor the final selection, subject to approval by the Board, Association of “OLYMPOS”. The HEPTAPOLIS academicians will constitute the supreme body that will award prizes, at the ZOSTER mansions, to the international cultural, scientific and artistic events, in the form of competitions, exhibitions, presentations, special lectures, film festivals and so on. All the prizes, awards and plaques presented, all prizes, distinctions, and awards will be signed by the Chairman of the Board. Association of “OLYMPOS” and the President of the ACADEMY OF NATIONS. The Function of Academics extends to their participation in global problems that require a solution for the societies of the planet. The ultimate objective is, the academies of the countries of the world to become members of the ACADEMY OF NATIONS, in terms of active citizenship problems. The ACADEMY OF NATIONS will be housed in the Acropolis of the “HEPTAPOLIS”. If more than one tenth of the members of the Academy ask for the trial of an academic, for launching, because of misconduct, the case will be introduced to the special court “HEPTAPOLIS”, which will consist of three special judges and a secretary. The procedure will take place in the ACROPOLIS, in a special hall of THEMIS, attending only to the members of the Academy and any witnesses for the prosecution and defense. The half-pay of academics will be paid by the authoritative sponsor of their country and the second half of the fee by the “HEPTAPOLIS”. Social security and retirement of academics will be provided by their country. The travel expenses of Credit, on matters relating to the Academy of Nations will be covered by the “HEPTAPOLIS”. Any other form of transportation will be covered by their country or themselves. The PRYTANEION will be housed in a circular marble gallery called STOA OF THE MUSES, within the large ring of the KYTTARON. The building will include meeting rooms, Rectors’ chambers, Senate chambers, Dining room, Pubs, library, cinema and fitness center. The NINE SCHOOLS of the KYTTARON are housed in nine building complexes, corresponding to the specialty of each school. The Deans monitor, verify and ensure the smooth operation of all special classes housed in the building of the Schools as well as teachers, applying the material taught, and the progress of students. A dean is considered one of the professors of the School, which is also “SYGKLITIKOS”, that is, a member of the Senate of teachers of all Schools of “HEPTAPOLIS”. The dean is appointed by a majority of the Senate and the title of Dean is valid for 4 years. The Council of Nine is composed of nine rectors who govern throughout the region of the KYTTARON, including the THOLOS. The Council of Nine is composed of nine rectors who govern throughout the region of the KYTTARON, including the THOLOS. The Council of Nine has a president, vice president, secretary and six members. The SYGKLITOS teachers are to teach in the cells under the Deans’ Council of Nine, to be elected every four years. The officers of the Senate of teachers will be elected, and will officially introduce the proposals on any issue relating to “HEPTAPOLIS”, the Council of Nine. If censure is given on a member of the Council of Nine, the proposal should be adopted by more than four members from the nine members of the Chancellors, to be debated, necessarily including the president casting his vote. Each class of the school will have a COMMISSIONER, elected every four years, who will head the College of his classmates. The COMMISSIONER will be responsible for oversight of respectable appearance and behavior of his classmates, the cleanliness of the room, the integrity of all relevant materials, and the flawless operation of the institutions of the “HEPTAPOLIS”, the student-school relationship and will update the Senate on any matter related to the class. body required for any request to be recommended to the body of the Senate . Each year on March 20, when the sun moves from the winter solstice to the spring, will be celebrated throughout the “HEPTAPOLIS”, the ISIMERIA EORTI (EQUINOX HOLIDAY). The “ISIMERIA EORTI” (EQUINOX HOLIDAY) is dedicated to protecting the natural environment in both northern and southern hemispheres. 3. Earth, as a life of all beings and phenomena. For the three-day events of the “ISIMERIA EORTI” (EQUINOX HOLIDAY) (March 20-21-22) will be invited donors of the “HEPTAPOLIS”, ecological and social actors, scientists, intellectuals, researchers, politicians and heads of state from all over the world, to the building complex GREEN PLANET EARTH. In the research centers, seminar rooms and conferences in the ZOSTER will be discussed, examined and considered all the activities of people in the world whether beneficial or not that relate to outbreaks of war or peace achievements, environmental actions, scientific support for ecosystems, the struggle of ecologists for maintenance and conservation of the species of animal and plant life in the Air, Earth and Sea, struggles of scientists for the improvement of air, land pollution, water and seas. On the day will be awarded, apart from others, a political leader who fought on a demonstrably personal and national level, that current year, for the health of the planet. Awards will also be granted to all public and private entities that have shown full commitment and activity to saving the ecosystem. On this day, from sunrise to sunset, the central portal of the light of “HEPTAPOLIS”, and the gate of Hymen of the ZOSTER, are open, and the sun during the hours of sunrise will intersect the “HEPTAPOLIS” into two equal parts thus symbolizing the high significance of the day. The crystalline ESTIA SPHERE, the crystal ball with the Sanctuary Light, will be transferred from the THOLOS of Central Square building complex GREEN PLANET EARTH as a global “spiritual pilgrimage”. On this day will be invited by the principles of “HEPTAPOLIS”, Heads or representatives, mayors of large cities, academics, leading figures of literature, arts and sciences, and especially the “aristocracy of the philosophers” of the 5 continents of the Earth . Before the ESTIA SPHERE a tribute or dedication will take place in relation to the meaning of the celebration. The presidents of the association “OLYMPOS” and the ACADEMY OF NATIONS will be spoken and will declare the start of the celebration which will consist only of events that take place in the MELATHRON of the ZOSTER in the PALACE OF EUROPE, in the KOILON of the OLYMPIADS, in the ARISTOPHANES THEATER and the building compound GREEN PLANET EARTH. Musicians, poets, writers, directors of films and documentaries, will present and argue this day their works, which have been previously approved by relevant committees, and related to the sense of great celebration. The Universities of the world will participate via computer connected to the Web with “HEPTAPOLIS” on festive and other events. During the ISIMERIA EORTI (EQUINOX HOLIDAY), the major political figures will be able to engage with their counterparts. More generally in the spirit of the day, it will be possible to make agreements or communications that consolidate security and preservation of natural resources of the planet, eliminating the conditions of pollution of the air, the earth and seas, protection of the geosphere and hydrosphere and general development of Ecological Education. The ISIMERIA EORTI (EQUINOX HOLIDAY) events will be open to all members of the Universal Intellectual Center “OLYMPOS”, and any other form of members and donors “HEPTAPOLIS”. The principle of Classical Greek Civilization is the performance of body and mind through the contemplation which seeks the ideal, the approach of the Integrated Human. The true OLYMPIC SPIRIT, always wanted this. The “HEPTAPOLIS” will be the world center for the operation of the Olympic Games Spirit, Art and Science. The matches will be held every 4 years in the KOILON of OLYMPIADS in the ARISTOPHANES THEATER and AMPHICTYON’S MELATHRON. Sculptors, painters, designers, engravers, composers, poets, writers, architects, inventors will compete in the KOILON OF OLYMPIADS and the measure of their award will be the identification of the work with the “good and the noble” advocated by the Olympic ideals. Special Committee composed of members of the ACADEMY OF NATIONS, the DEANS and AMPHICTYONS will honor the best projects, with a prize, a gold “kotinos”. In the KOILON of OLYMPIADS, before 25,000 spectators and critics, the games will be carried out by reference to the work of each of the participants and the usefulness of performance in the societies of the world. Competitors will carry the games, to consolidate the spirit, peace and democracy, whether ordinary people or politicians or scientists, or even heads of state will be selected by the Committee of Amphictyons and taking honors as the Olympic kotinos. This will be the highest honor for the citizens of the world struggling to uphold moderation and to combat all forms of pressure, violence or terror against the people of the world. Students in the “HEPTAPOLIS” will be able to study who demonstrated excellence at the University where they had studied and wish to extend their studies in the use of knowledge to take the High diploma of “HEPTAPOLIS”, the kotinos. The choice of these students will be from the Ministry of Education of their country, with the basic requirements of the “HEPTAPOLIS”. The number to be accepted will be in specific according to field by each country. Students will be admitted who have the best grades on the examinations, and will be followed by the runners-up. In the process of examination, there will be monthly practical and theoretical tests and success is achieved by having more points. The first period of study of the students is called «Exoteric Teaching» and the second term «Esoteric Teaching». The Deans of “HEPTAPOLIS” will be the Selection Committee. The examinations will be given in the special building of the ZOSTER, the “GYMNASIUM”. Period theoretical and practical “test” in the gymnasium of the ZOSTER. As long as the requirements of the examinations are met, the students will be admitted into the KYTTARON to study in principle as “Exoteric” students. Period of study “Foreign Teaching”. Participation of “exoteric students” in the events that take place in the outer zone “HEPTAPOLIS”, in ZOSTER. In the area of the ZOSTER all centers of Letters, Arts and Sciences, the Melanchthon, the Museums, the Alexandrian World Library. They will monitor and participate in film festivals, seminars, spiritual – cultural contacts with other universities and colleges in the world. They will work as assistants in research centers, will attend and participate in conferences, symposia, intellectual, etc. Introduction for the esoteric students. Study in the Schools at all levels of Sciences, “the dialectical process” in walks, lively acquaintance with the microcosm and the macrocosm within the THOLOS. During the examination period of 3 months, the will write the HEPTAD, their doctoral thesis in the USE OF KNOWLEDGE, which is the evidence of their awareness of the universal values and ideals of the “HEPTAPOLIS”. Following the tradition of the HEPTAD will be the festival of the award of the “kotinos” which is a golden olive branch, built onto their diplomas. And on that day they will be given in the THOLOS, THE OATH OF THE THOLOS. The first half of the costs will be covered by the relevant Ministry of the country, to which the students belong as citizens. The second half of the costs will be covered by the “HEPTAPOLIS”, through special grants permanent sponsors – donors. The costs will be cover the entire study period, and will cover food and accommodation. The students will choose the branch school. The literature, exercises, questions for study, and generally considered, the material, is exclusively the material of the “HEPTAPOLIS”. In any other University or School of the world there is no similar course material. This material will be drawn from optimum select group of teachers, from Greece and other countries, predominantly Greeks who will write literature, books, studies, essays, plays, drawings, paintings, which are intended principally for the “USE OF KNOWLEDGE”. Whatever the student learned in any University or School must address the question “what does it serve with respect to the common good” with “the Good and the Noble”? And since the student “enters” into the world of ideas of the “HEPTAPOLIS” based on a curriculum grounded on the “USE OF KNOWLEDGE” with the principles of classical philosophy, analyzed, documented and appropriately to events in each new era, in turn, the student will be given an opportunity, on examination, to present his own material, to use his special knowledge, based on what will promote the good and the noble as taught by the “HEPTAPOLIS” . The written statement of these materials will be the “HEPTADS”. During the External Teaching, the disciples will undergo the “tests” that will relate to psychosomatic and mental tests, according to classic archetypes. During the “Esoteric Teachings”, the disciples will have no contact with the outside world; schooled in the context of strict intellectual isolation, they will be obliged to complete control of their nervous system as to communicating with each other. The food will be strictly planned. Beverages, cigarettes and any form of such pleasures would explicitly forbid and any form of entertainment in the area of cells can have only educational, epistemological and moral character. After the term in the USE OF KNOWLEDGE, the students will give, in the spherical building of the THOLOS in the center of “HEPTAPOLIS”, the “OATH OF THE THOLOS” (Dome) , which is a promise of dedication to only the “good and noble”, throughout their lives. After the oath is read aloud, they receive the “kotinos” the diploma papyrus incorporating the gold olive branch. The “kotinos”, will open a “career horizon” for the student, it will forward his name through the “HEPTAPOLIS”, in all major centers of science, research, and companies in the world. The names of the graduates will be given each year to special bulletin boards in specificity, with access from private or public institution in the world to find on the board, the partner whom he believes meets his business needs. Along with receiving the kotinos, the graduate will be called, “citizen of HEPTAPOLIS”. The title is for life and gives life-long rights and privileges but also obligations to the ideas and objectives of the “HEPTAPOLIS”. In any breach of regulations “HEPTAPOLIS” by the owner of the kotinos, the Deans would have the right to invalidate the privilege of citizenship for life from any infringer.